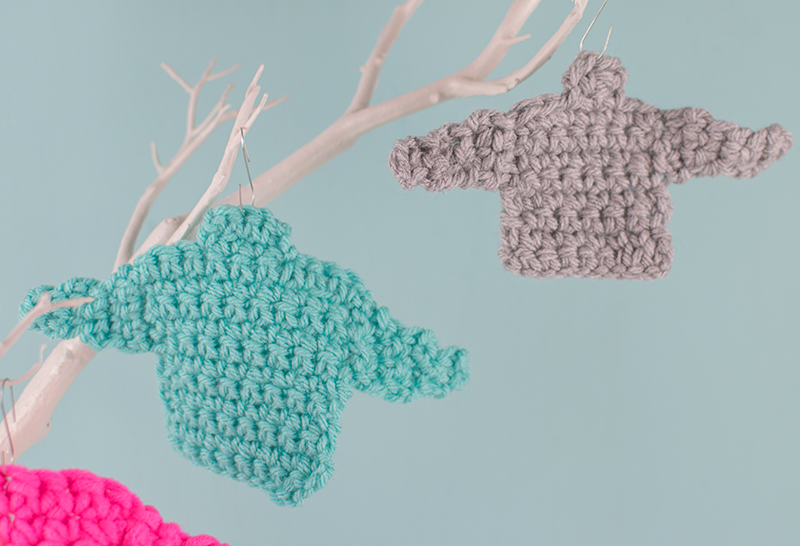 Yesterday I shared my post on how I made mini knitted jumpers and today I am going to show you how to crochet mini jumpers. I should probably point out that I only learnt how to crochet at the start of the year and this is the first thing I’ve made without using a tutorial so it might not be perfect but I don’t think they turned out too badly. These are the same as the knitted version in that there is just one side to them, if you wanted to replicate an actual mini jumper then you would need to make two and sew them together but I was happy with them like this. If you don’t know how to crochet but would like to learn then I would really recommend Bella Coco’s video tutorials, I used this granny square tutorial to learn and have since used about 10 of her other tutorials. She’s fab! I used chunky yarn and a 6mm crochet hook. I am also using UK crochet terms so if you are in America then you will need to use single crochet (sc). 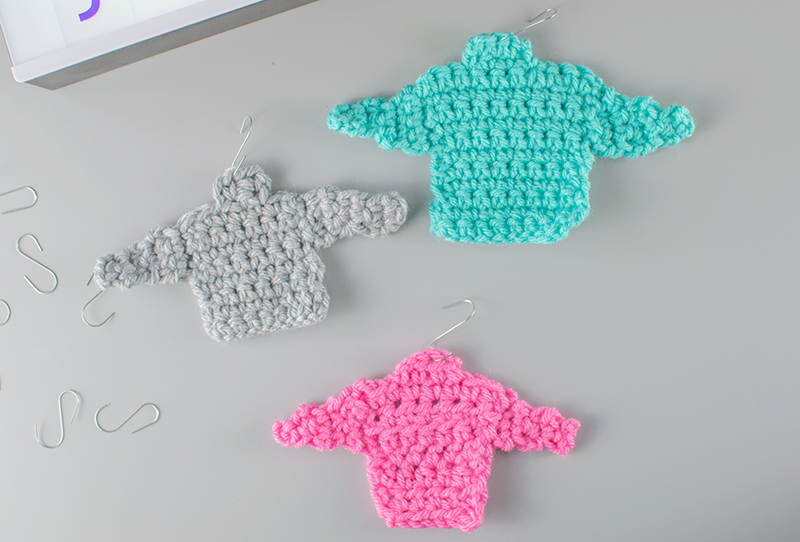 I started by chaining 10 but you can just chain the right amount for the width you want your mini jumpers to be, obviously this will be different depending on what size hook you are using and the type of yarn. I then used the double crochet (dc) stitch to work four rows into the piece, again you could just add as many as you think to make it look like the body of your jumper. When you have reached the end of the last row chain stitch into three stitches (or more depending on the size of your jumper – you need them to reach just above the halfway point) running down the side of your jumper to give you the base for the arms then chain one in the first space before putting a double crochet (dc) stitch into the next two spaces. Then either work another row of three stitches or start to decrease them depending on how you think it looks and the size of your jumper. I did three in the first row then two in the next two rows. Finish and cut off the yarn. 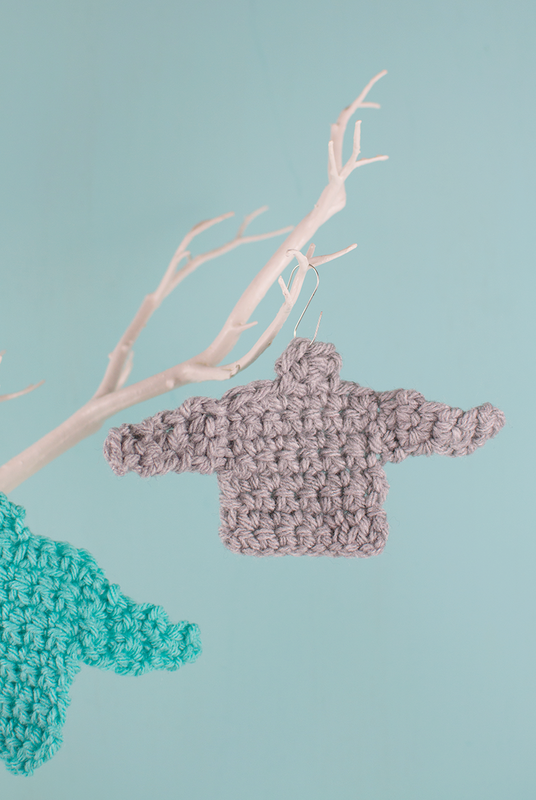 Attach your yarn on the other side of the jumper in the top corner. Chain stitch into three stitches in the same way you did on the other side then do the same as you did for the other arm. Finally find the centre stitch on the top of the jumper and join your yarn to the stitch to the left of it. Depending on the size you might need to attach it two stitches to the left, or even three. Then work one chain stitch into the first space and double crochet (dc) stitches into the next two spaces. This number might be different if you joined on more than one stitch to the left. Obviously just make sure you have the same amount of stitches on each side of the centre stitch. I hope these instructions aren’t too hard to understand, I’m still not that clued up on all the crochet language myself so it’s hard to explain what I did to others! I will make a video tutorial at some point though as I think it would probably make more sense if I showed you. Oh and you could really do anything with these, I used them as ornaments on my Christmas tree but you could also make a garland with them.